My name is Kujtim Musli, I'm a friend of Egzon's family, I live in France, by their request I created this campaign to help Egzon's family pay medical expenses. All these funds will be used to pay medical expenses of Egzon, in Acibadem hospital in Istanbul, Turkey. These funds firstly will be withdrawn to my bank account, I will transfer all the funds immediately to Egzon's father: Rame Kryeziu. 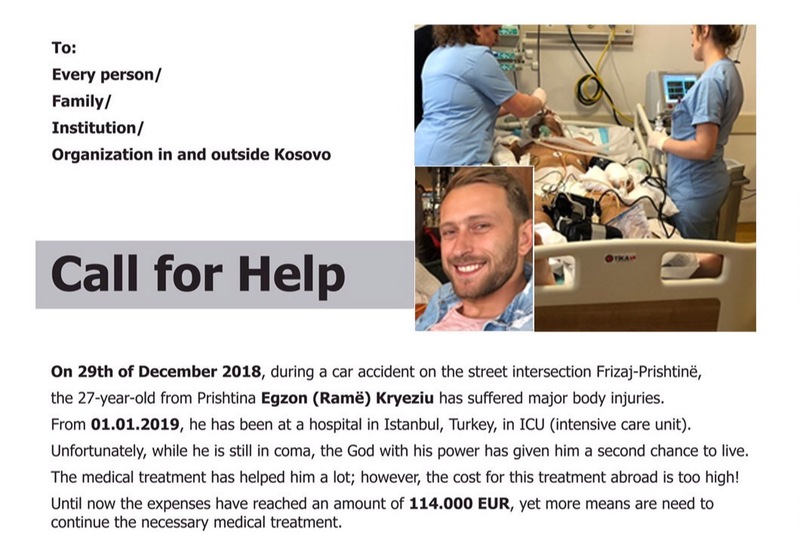 On 29th of December 2018, during a car accident on the street intersection Ferizaj-Prishtine, the 27-year-old from Prishtina Egzon (Ramë) Kryeziu has suffered major body injuries. From 01.01.2019, he has been at a hospital in Istanbul, Turkey, in ICU (intensive care unit). Unfortunately, while he is still in coma, the God with his power has given him a second chance to live. The medical treatment has helped him a lot; however, the cost for this treatment abroud is too high! Until now the expenses have reached an amount of 114.000 EUR, yet more means are need to continue the necessary medical treatment. Due to the inability of his family to afford the expenses, we kindly ask for help from everyone how is willing to contribute for Egzon. Every contribution from you menas more hope for the life of Egzon, for this we will be forever grateful and appreciative!